An Interview with Patrick Lee, full time trader at the Singapore Monetary Exchange (SIMEX). 09:54 – Futures vs Equity – which is easier? 25:02 – How much should a new trader need to get started? 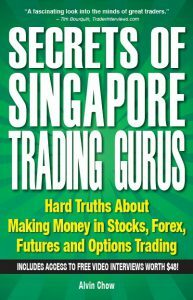 For the full transcript and other tidbits not found in the video, do click here to grab a copy of the Secrets of Singapore Trading Gurus.